Remove stubborn dirt and grime from fabric and vinyl! McKee's 37 Marine & RV All-In-One Fabric & Vinyl Cleaner is a safe and effective solution for cleaning all of your boat or RV's fabric and vinyl surfaces. This one-step formula breaks up dirt and grime so that you can simply wipe it away. Use McKee's 37 Marine & RV All-In-One Fabric & Vinyl Cleaner on canvas boat covers, vinyl cushions, inflatable boats, deck awnings, bimini tops, and just about any other fabric or vinyl surface in or around your boat or RV! The fabric and vinyl surfaces of your boat or RV are prone to a significant amount wear and tear. When you're using them, you're usually outside in the elements, and most boats and RVs are stored outside. This can lead to some tough soil and stains, but that's not a problem for McKee's 37 Marine & RV All-In-One Fabric & Vinyl Cleaner. This gentle yet effective cleaner eliminates tough stains helping you avoid expensive replacement bills. 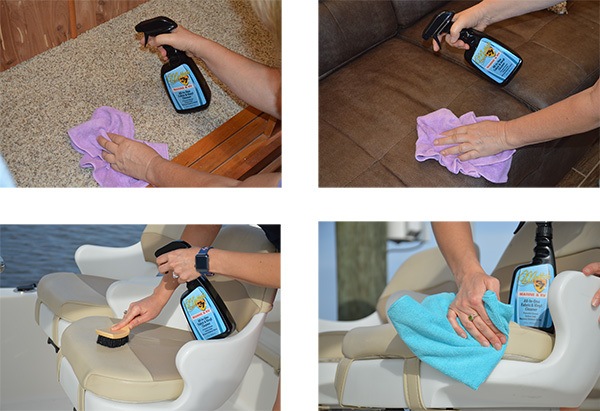 McKee's 37 Marine & RV All-In-One Fabric & Vinyl Cleaner is as easy to use as it is effective. Simply spray a liberal amount of cleaner onto the surface and agitate using a soft bristled brush, allowing a minute or two of dwell time if necessary. Rinse away any excess and enjoy the results! Easily clean the leather and vinyl surfaces in both your RV AND your boat with McKee's 37 Marine & RV Fabric & Vinyl Cleaner! 1. Thoroughly rinse surface to remove loose debris. 2. Apply a liberal amount of cleaner onto wet surface. 3. Agitate using a soft bristled brush. Difficult stains may require 1-2 minutes of dwell time before agitating with a brush. 4. Rinse thoroughly. McKee's 37 Marine & RV Mildew RemoverMcKee’s 37 Marine & RV Mildew Protectant SprayMcKee’s 37 Marine & RV Water-Resistant Vinyl ProtectantMcKee’s 37 Marine & RV Gloss Enhancing Final PolishMcKee's 37 Marine & RV Hydro Pearl Sio2 CoatingMcKee's 37 Marine & RV Final Step Detail WaxMcKee's 37 Marine & RV Carnauba Wash & WaxMcKee’s 37 Marine & RV Heavy Duty Cleaner WaxMcKee’s 37 Marine & RV Repel Glass & Plastic CleanerMcKee’s 37 Marine & RV All Purpose Surface CleanerMcKee’s 37 Marine & RV Bug Remover & Wax RestorerMcKee’s 37 Marine & RV Vinyl Decal & Graphic RestorerMcKee’s 37 Marine & RV Heavy Cut Oxidation RemoverMcKee’s 37 Marine & RV Carnauba Sealant WaxMcKee’s 37 Marine & RV One-Step Polish & SealantMcKee’s 37 Marine & RV Repel Glass & Plastic Cleaner 128 oz.McKee's 37 Marine & RV Final Step Detail Wax 128 oz.McKee's 37 Marine & RV Carnauba Wash & Wax 128 oz.McKee's 37 Marine & RV All Purpose Surface CleanerMcKee’s 37 Marine & RV Bug Remover & Wax Restorer 128 oz.